As it happens we haven't seen much of the white stuff here in Boston. 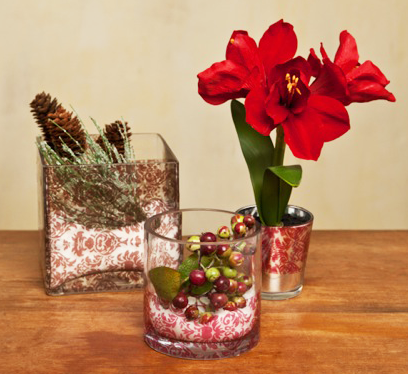 All the more reason to make snowy centerpieces out of Brown Damask and Cranberry Red Damask tape. Clear glass containers with straight sides work best for this project. Our Damask patterns which are all on transparent tape stock work best with a more solid vase filler like the powdery snow we used but the sky's the limit with ideas.